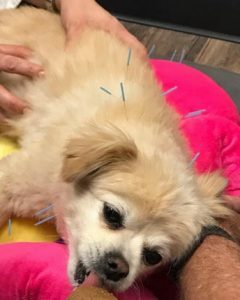 Coach, a 10-year-old neutered male Pomeranian mixed breed dog was treated for acute tetraparesis for approximately 7 weeks using alternative therapies including laser and acupuncture and made a full recovery. Coach is a healthy senior pet who had one episode of suspected IVDD 6 months prior when he presented with a hunched posture and signs of pain. He responded quickly to restricted activity and oral medications and had no other concerns prior to this presentation of tetraparesis. This case report suggests the significant positive effects of acupuncture and laser therapy, in conjunctive with appropriate oral medications, to treat a condition in which surgery is often performed and may be unnecessary and cause undue pain and trauma. Coach, a 10-year-old male neutered Pomeranian Mix breed dog, was treated using acupuncture and laser therapy, in addition to appropriate oral medications, from May 10, 2018 through June 28, 2018 following a sudden onset of tetraparesis. Coach was evaluated initially through ER and then transferred to the Veterinary Neurology Department at the same facility. When Coach presented to the ER, he had been staying at the pet sitter’s house where he reportedly became acutely unable to ambulate or use any of his four limbs after an altercation with another dog in the home. He did not obtain any punctures or external wounds and it was reported that the altercation was a series of growling and vocalizing but no actual trauma or bites witnessed. Prior to this episode, Coach had been suspected to have a disc herniation approximately 6 months prior when he presented to his regular veterinarian for hunched posture and pain. Coach was treated at that time with restricted activity, an oral steroid, and an oral muscle relaxer. Coach quickly responded to therapy and returned to normal activity with no follow-up visits or reported concerns until he was seen at ER in early May. Approximately 72 hours prior to my initial exam and commencement of treatment on Coach, he visited a local Veterinary Emergency Clinic where he was hospitalized and then transferred to the Neurology Department for evaluation and further care. Upon presentation to the ER, Coach was described as having a right-sided hemiparesis with absent Conscious Proprioceptive (CP) Responses on the right fore and hind limbs with minimal motor function and a resistance to neck manipulation on the right side. His mentation was noted to be normal/appropriate. His vitals were normal at the time of presentation and his blood testing (including a chemistry, complete blood cell count, and blood gas test) were all largely within normal limits other than a mildly elevated Alkaline Phosphatase (ALP). Radiographs of his cervical, thoracic, and lumbar spinal regions were taken and demonstrated a narrowing at the C4-C5 intervertebral disc space. Coach was hospitalized overnight and placed on IV fluids and an IV CRI of Fentanyl for pain management until he was assessed the next morning by the Veterinary Neurologist. When the neurologist evaluated Coach, Coach was noted to have tetraparesis with strong motor function on the left side and minimal to no motor function on the right side with his right thoracic limb being the most severely affected. An MRI was recommended with potential Surgery Consultation as the next step based on the MRI findings. The owners declined this recommendation and opted for conservative management. He was then started on an oral steroid, muscle relaxer, and pain medication and discharged. Thankfully, their regular veterinarian recommended they schedule an assessment and consultation with me to discuss treatment options not limited to rest and medications, but to include acupuncture and laser therapy to not only aid in pain control, but improve function and healing much more rapidly than conventional methods. On initial examination, Coach was a very sweet boy still in a fair amount of pain. His extra neural abnormalities included an overweight body condition score of 7/9, moderate dental disease, patellar luxation, and lenticular sclerosis, but he appeared overall healthy for a dog of his breed/age. On his myofascial palpation exam and neurologic exam, he had several abnormalities. Coach was non ambulatory. With assistance holding his weight, he would attempt to take a step using his left limbs but would immediately fall over as he was unable to place any weight on his right side. All four CP responses were severely decreased with his right front being most severely affected followed by right hind, then left hind, then left front limb. He had crossed extensor reflexes present in all four limbs but was most exaggerated when Coach was laying left lateral and upside (right) limbs cross extended. Coach had a good neck range of motion in ventral and left lateral directions but was reluctant to turn his head to the right side or orient it in a dorsal direction. Myofascial strain patterns were noted in the thoracic myofacia and taut bands noted on right and left cervical neck. Coach was painful on palpation in his dorsal cervical neck regions from C1-C5, there was also heat noted in this region on manual assessment. The only additional diagnostic testing that was performed on initial presentation was a Valley Fever blood test that came back negative. Differential diagnosis given Coach’s presentation included: Fibrocartilaginous emboli (FCE), intervertebral disk herniation/protrusion, infectious disease (i.e. Valley Fever, Tick Fever), neoplasia, trauma, or autoimmune/inflammatory diseases. Tetraparesis due to cervical myelopathy with a neuroanatomical diagnosis of C1-T2 myelopathy with right lateralization. This putative diagnosis was based on physical evaluation and neurological examination on Coach at the time of our first visit. It is suspected that this cervical myelopathy was due to Intervertebral Disk Herniation /Protrusion but the definitive diagnosis was not determined due to a lack of advanced imaging but was supported based on radiograph findings. Once the presumptive neuroanatomical diagnosis was reached based on physical and neurological examinations on Coach, the medical decision making was based on using the MAIN (Medical Acupuncture and Integrative Neuromodulation) technique developed by Dr. Narda Robinson. With this technique, for each treatment I performed on Coach, I focused on using acupuncture to stimulate the Central, Autonomic, and Peripheral Nervous Systems as well as the myofascial component. Both localized and consequential strain patterns were palpated in the myofacia on every exam performed prior to treatment. Starting on day 1 of meeting Coach, I performed acupuncture and laser therapy once to twice weekly for a total of 7 weeks. This 7 week course was approximately 2 weeks post witnessing complete resolution of his presenting clinical signs. Coach underwent 9 total acupuncture treatments and 10 laser therapy treatments over this 7 week time period. The additional laser therapy session was performed on a day I was not in the office to perform an acupuncture treatment early on in the course of his treatment and recovery process. The laser therapy was performed using a Class 4 Companion Pet Therapy Laser at a setting of 4 W with a Continuous Wave (CW). Coach’s first acupuncture treatment consisted of the fewest acupuncture points when compared with subsequent visits. Coach was very painful on initial evaluation with certain regions of his cervical and thoracic spine that he did not want touched at all. In addition, this was his first exposure to acupuncture and I wanted to make it a positive experience for him so that he would willingly come back again. This approach proved to be successful as Coach loved coming in to have his treatments done, and his owners report Coach would get excited even nearing our veterinary hospital on the car ride. Dry needle acupuncture was performed using Seirin J-Type 0.16 mm diameter by 30 mm length needles. My technician assisted in distraction by feeding Coach a frozen treat of Royal Canin Gastrointestinal Low Fat Canned food with the occasional Pill Pocket treat. These same treats would be used for each subsequent therapy session on Coach as he did great with them and focused solely on the treat provider vs. his needling. On day 1 of treatment, the needles were placed in the following locations (all bilaterally placed unless otherwise stated or unilateral point): GV 14, BL10-13, LI11 (right), LI 10 (right), LU7 (right), two Cervical spinal nerves (located at C4 and C5 – right side), and Bai Hui. The needles were left in place from 15 to 30 minutes on this as well as all subsequent treatments. These points were chosen in an attempt to avoid Coach’s most painful cervical region and treat cranial and caudal to the lesion as well as using points for good autonomic stimulation. I did not attempt any distal limb points as he didn’t appreciate his feet touched. Laser therapy was completed to cervical region and thoracic regions. Coach showed great improvement in the first 48 hours between treatment 1 and 2 with lessened pain noted and his attempting to take 2-3 ataxic steps when assisted to stand prior to falling over. The second treatment was performed using Seirin J-Type 0.16 by 30 mm diameter with the exception of GV 20. Coach demonstrated sensitivity to needling on his head at his last visit so a Seirin J-Type 0.14 x 15 mm needle was used in this location and Coach tolerated that better. Needles were placed in the following locations: GV 20, GV14, Bai Hui, BL12-15, BL 25, LI11 (right), and 4 cervical neck points, 2 on each side ~C3-C4. To finish his treatment, an Assisi Loop was placed over Coach’s neck while laser therapy was performed to his neck and thoracic regions. The next treatment was scheduled for 1 week later and I instructed owners to start basic home PT including daily passive range of motion exercises, assisting to a stand position, and water therapy using a life vest so he could motion his limbs in their normal activity without his body weight limiting him due to his injury. It was recommended that Coach be allowed to attempt to ambulate around a small, confined area of their home with traction on the floors such as carpet or area rugs, but I recommended that Coach still be restricted from any running, stairs, navigating steps, etc. Coach’s third treatment (week 2) consisted of similar dry needling technique performed at each session followed by laser therapy to his neck and thoracic region. The same needle selection was chosen as Coach seemed to tolerate it well on the first two sessions with a Seirin J-type 0.14 x 15 mm needle placed in GV20 and Seirin J-type 0.16 x 30 mm needles placed in other locations. The additional points chosen for this visit in addition to GV 20 were GV14, two cervical neck points on right and left side (~C3-C5), BL 25 (right), LI 11 (right), BL 10, BL 11-13, and BL17-20, and Bai Hui. Since Coach was becoming both less painful in his cervical and thoracic spinal regions as well becoming less reactive to needling in general, I was able to expand treatment points to include more of the Bladder Line with BL17-20 added to this visit. It was also noted on his myofascial exam that he had formed taut bands and trigger points in his Illiocostallis, Trapezius, and Latissimus Dorsi muscles on both sides, presumably due to compensation from his initial suspected compressive injury. Repeat palpation post treatment revealed improvement in these regions. The Assisi Loop was placed over his caudal thoracic region with laser therapy applied from his cervical through lumbar region. Mobility continued to improved vastly and on his Week 3 visit, Coach was ambulatory in all four limbs with only slightly slow CPs on right side and occasionally dragging his right hind. He was able to get up on his own and minimal to no pain was noted. The treatment plan was similar to other treatments thus far and performed using Seirin J-type 0.16 by 30 mm needles in the following locations: GV20, GV 14, BL10, BL18-21, BL25, Bai Hui, GB21. All points were selected based on palpation of myofascial strain patterns and tender regions on his exam. The Assisi Loop and laser therapy portion of his treatment were again performed at the end of the session with no changes made. Although Coach continued to show improvement at each subsequent visit, I opted to recommend treatment once weekly to every other week (based on his owner’s availability) for 4 additional weeks to ensure treatment was continued long enough for full resolution of presenting signs with no relapses. Treatments were all performed using the same dry needling technique, same acupuncture needles, and the Assisi Loop as well as laser therapy to end our sessions. Any changes made to point selection were based on that day’s myofascial evaluation. In less than 7 weeks of treatment, Coach went from being tetraparetic and completely non ambulatory to regaining full function of all four of his limbs. His CP responses were initially all severely decreased and returned to normal within 4 weeks of initial treatment and in addition, he regained full motor function, which was greatly diminished prior to treatment. Even more impressive was a significant improvement in his mobility noted on his second exam, just 48 hours after his first treatment where Coach was already starting to walk by taking a few steps at a time. It is my opinion that when Coach’s course from injury to recovery was compared to other cases seen and treated previously in many years of practice, it is far superior in his overall return to function as well as speed in that return to function. Coach’s recovery was in part due to his oral medications started at the time of his injury to help him heal, but significantly amplified by his additional therapies including acupuncture and laser therapy which were instituted early on in treatment. This notion that acupuncture and laser therapy speed healing times post Intervertebral Disk Herniation, as demonstrated here in Coach’s case, is backed by science and research. This case helped me see the healing benefits firsthand of acupuncture and laser therapy on a condition in which previously we were taught as veterinarians to instruct clients to give medications and confine the pet to a cage for an extended period of time. If acupuncture, as well additional alternative therapies, are offered early in the course of treatment of neurologic and musculoskeletal disease and aid in returning an animal to function more rapidly, we may be able to shift away from recommending surgery which is an invasive treatment option, yet still end up with favorable, even superior, outcomes for return to comfort and function more rapidly. It has been shown that acupuncture can both improve pain control and enhance a patient’s quality of life when suffering from many different diseases related to the musculoskeletal and neurologic systems more effectively than pain control medications alone. It seems logical that we as veterinarians should not be withholding this significant benefit to patients afflicted with many different disease and degenerative processes we encounter every day in practice. Draper WE, Schubert TA, Clemmons RM, et al. Low-level laser therapy reduces time to ambulation in dogs after hemilaminectomy: a preliminary study. J Small Anim Pract. 2012;53(8): 465-469. Hayashi AM, Matera JM, Fonseca Pinto AC. Evaluation of electroacupuncture treatment for thoracolumbar intervertebral disk disease in dogs. J Am Vet Med Assoc. 2007;231(6): 913-918. Janssens LA. Acupuncture for the treatment of thoracolumbar and cervical disc disease in the dog. Probl Vet Med. 1992; 4(1): 107-116. Silva NE, Luna SP, Joaquim JG, et al. Effects of acupuncture on pain and quality of life in canine neurological and musculoskeletal diseases. Can Vet J. 2017; 58(9): 941-951.